Onward and Upward – Run. Ride. Roam. Well, I have to say I felt a little bit sore in places this morning, after yesterday’s crash and the legs didn’t have quite as much vim in them as I would have liked, knowing we were going to have to tackle some hills on today’s ride. Oh well. 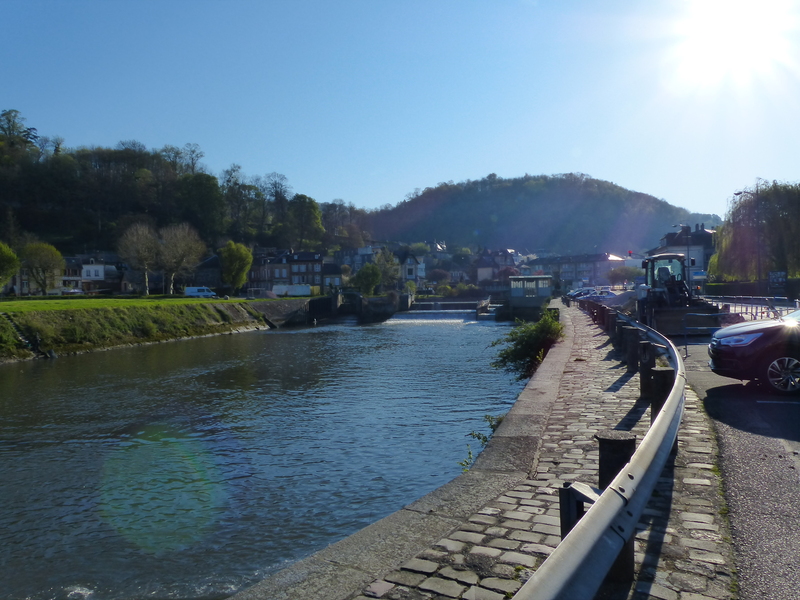 We headed out of Pont Audemer for our Sunday ride towards Rouen. The ride wasn’t terribly enjoyable, we were on a main road pretty much the whole way, so we had traffic zipping past us all the time and the wind was still blowing, both of these things tend to take the gloss off a ride somewhat. We had a few hills to climb along the way, a couple of which were real doozies, but thankfully they were spaced out with flat bits in between, where we only had the wind to contend with. 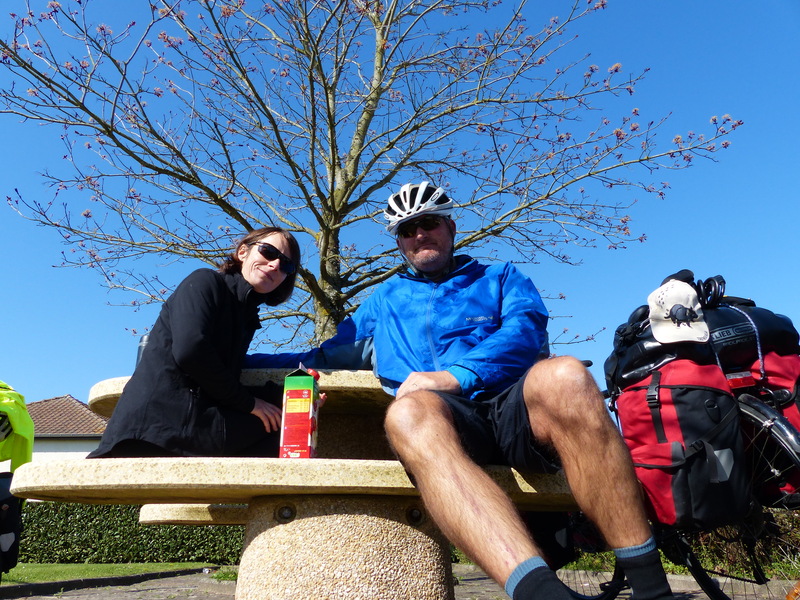 We stopped for elevenses at a picnic table beside the road and then headed off on what felt like “a day at the office”, just getting the ride done, rather than it being a leisurely or scenic pedal. 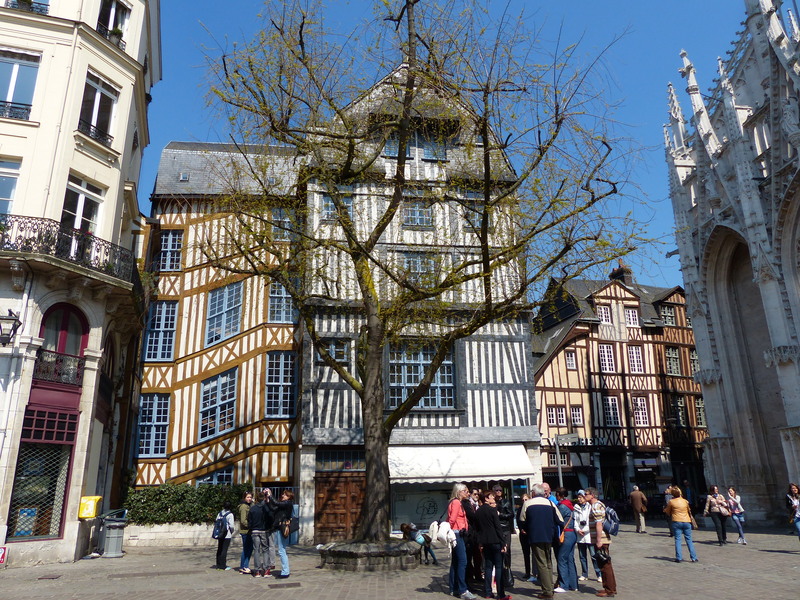 As we approached Rouen, the GPS route took us off the main road and up a hill into the suburbs. We both couldn’t quite work out what the technology’s thinking was, because we were riding through streets, down narrow little pathways in between houses and at one point, down steps! Now come on GPS! You have led us a merry dance with your choice of routes on more than one occasion, do you really know what you’re doing!? 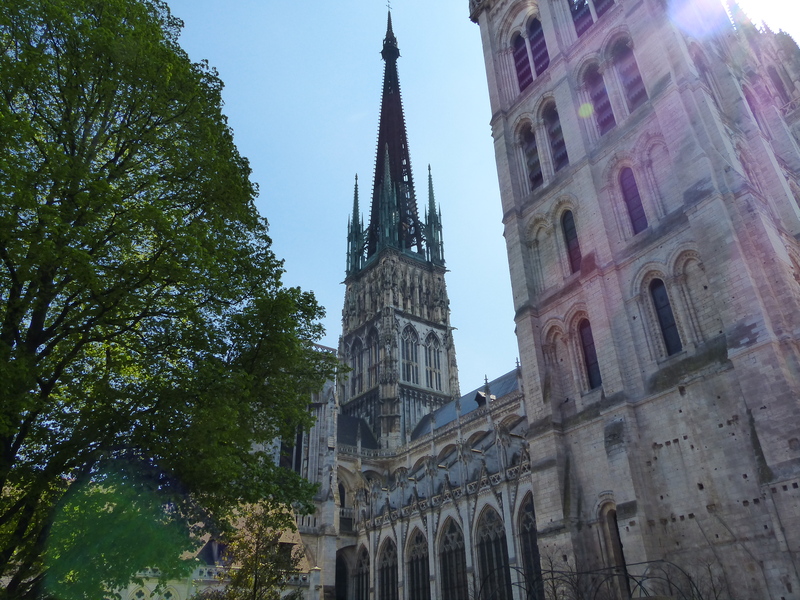 Well, finally we emerged onto a road that was clearly taking us towards the city of Rouen and we eventually ended up on a bike path. Ah, so that was it, the GPS must have thought it would send us round the houses and take us on a long and circuitous route around the neighbourhood, just so we would eventually end up on a bike path! There was method in its madness! The ride along the bike path was probably the first enjoyable part of the ride because it had trees either side, so we could ride through an avenue of leaves which was nice. We came to a lovely park and sat on a bench for a quick late lunch break. I tell you, I could have just sat in the sun there, out of the wind and quite happily just nodded off to sleep! But, no time for snoozing, we needed to keep going. 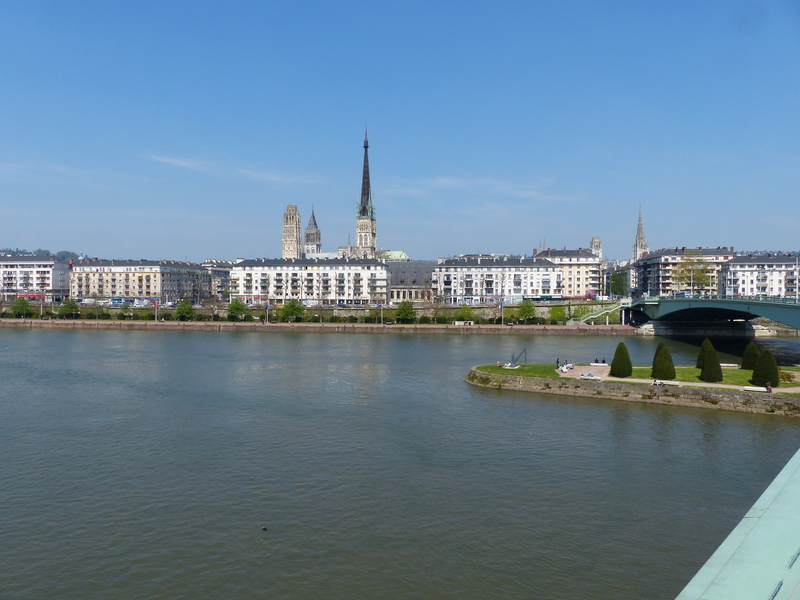 We rode into the city of Rouen itself and crossed the River Seine for the first time. 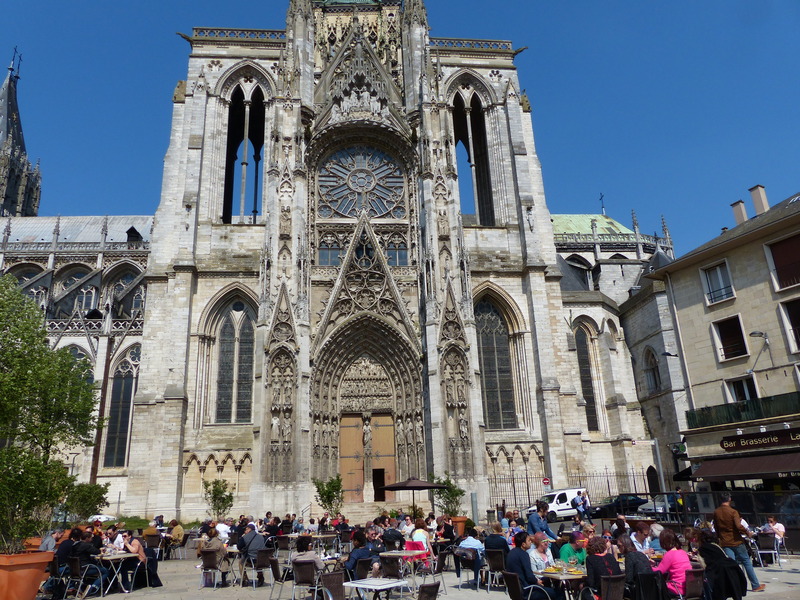 Then we continued on through the city, where we saw some beautiful buildings and an Abbey, so we stopped and got off to push the bikes around for a while to have a look at some of these lovely sights. 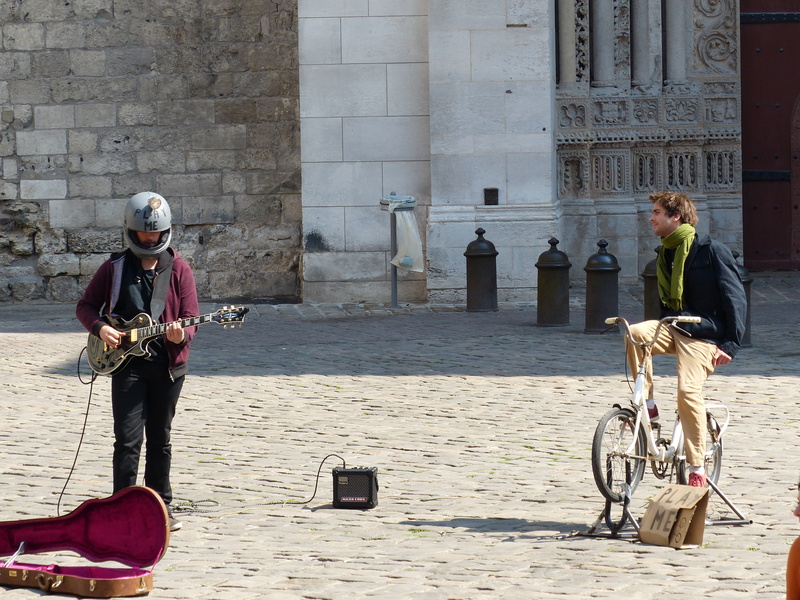 As we walked around I saw yet another example of different and creative busking…a fella playing electric guitar in a motorbike helmet (not sure about the significance of that), but his sidekick was on a bike pedalling away to power the amp for the guitar! Brilliant! As we headed out of the city, we came across an almighty hill. Now I know I’ve said it before, but I’ll say it again, city streets sometimes throw up the worst and hardest hills of all! They can be steep little suckers and this one was no exception..it sure was a toughie! Steve had actually warned me at the start of the day that we had a particularly big hill on today’s ride and we’d hit it at about the 50km mark. Well, as we’ve already established, I tend to worry about things (it’s what I do best…I could worry for Australia) and worrying about hills is my new daily dose of worry. So I’d been counting down the distance and waiting for it. I asked Steve a few times, “Was that THE hill? Have been up THE hill yet?” because we’d already tackled some big, long climbs. “No, we’re not there yet,” he’d say. So my worry set in. 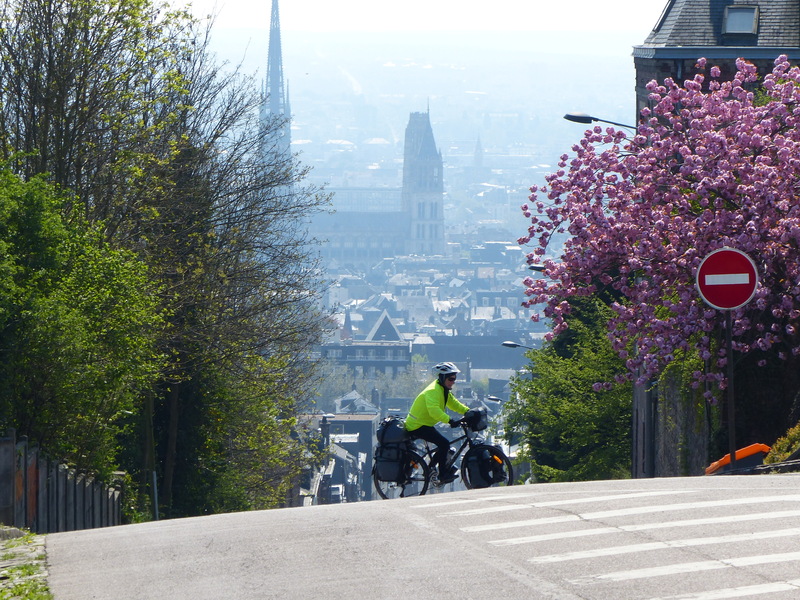 Well, we did indeed meet THE hill as we were riding out of Rouen and we hit it at the 56km mark, so the legs were already feeling a little bit fatigued! When I saw it, my thought was immediately, ‘You’ve got to be joking! No chance!’. There is no way I thought I’d get up it, with legs that were already feeling sore and tired. As always though, there’s nothing else to do but just pedal up the darn things, so I can worry and doubt and talk myself out of it all I like, but it’s not going to change the fact that I still have to climb it! Off we went and it was steep, with a bit at the top that got even steeper. We both stopped a couple of times on the way up, just for a breather and a drink of water and then kept pedalling, so we had a few hill starts to do along the way too. Well, we both made it to the top, all on pedal power, which I would never have thought I could do. My first words to Steve at the top were, “Was that THE hill?” because if it wasn’t and there was one worse than that still coming, the worry-meter would just explode off the scale. Thankfully he said, “Yes, that was it.” Phew, it was done, the worst was over! 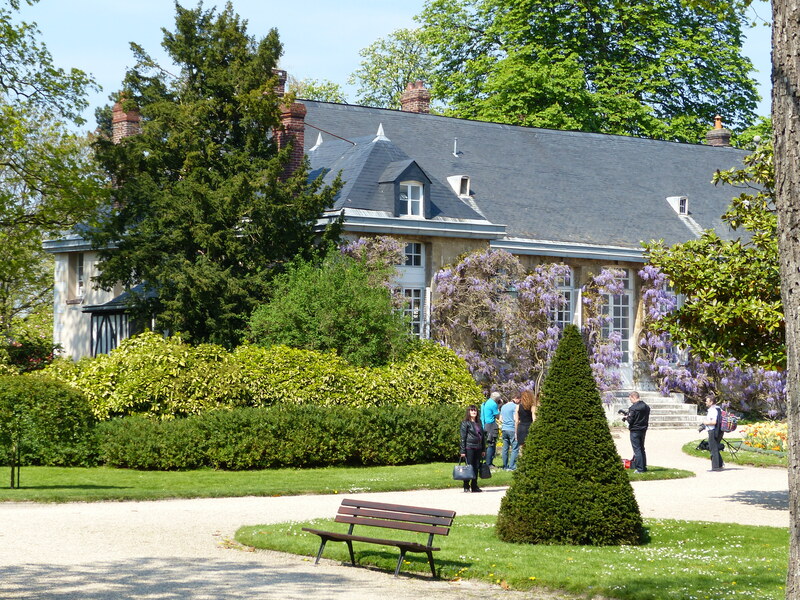 We continued on to a campsite that had shown up on the route, but it turned out it was only for motor homes, and since we are not one of the “travelling in luxury and comfort” style of tourists, there was no place for us. So, with no other campsites in the area, we are back in our regular Plan B chain of cheap and cheerful hotels, after 61km of pedalling. The legs were pleased to have made it so they could have a little rest and I was happy to dive into a hot shower and then have a much needed cup of tea! 1. I didn’t fall off. 10. 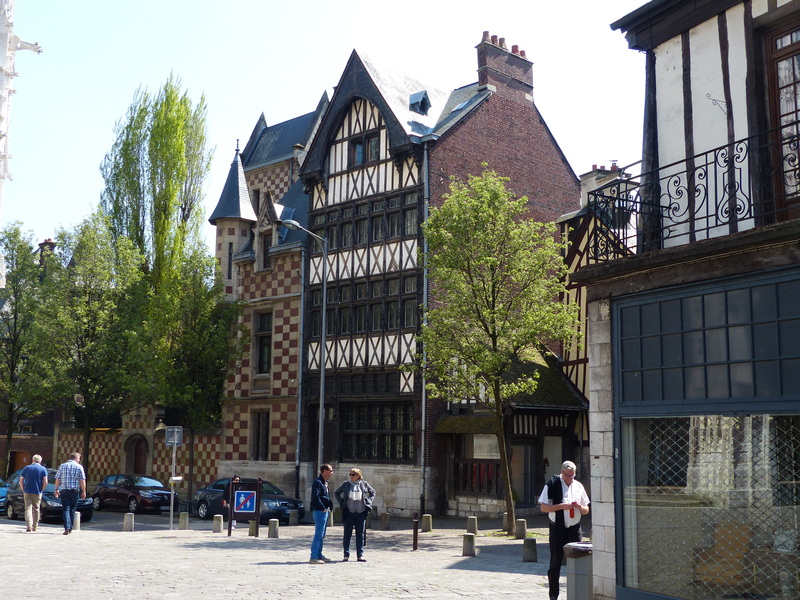 I’m still lucky enough to be riding in France, with beautiful and new and exciting things to see and getting to experience amazing and memorable things every day! Stoked! I’m sooo looking forward to that Anvers catch up!